A little drama played out yesterday as PSG beat Lyon 2-0 to extend its perfect record in the French league to six matches. 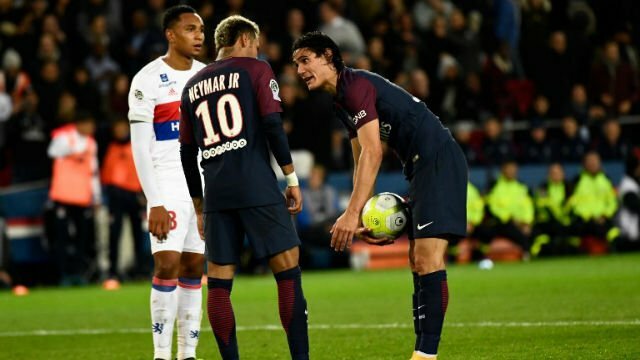 Moments before PSG’s penalty kick, star forwards Neymar and Edinson Cavani clashed over set-piece duties. A few minutes before that, Cavani had tried to take a free kick but Dani Alves took the ball and gave it to the former Barcelona star, unfortunately, Cavani’s 79th minute strike was saved by Lyon’s Anthony Lopes. Neymar’s action drew ire from football fans, with many claiming he was being disrespectful to a club legend, others applauded his move, adding that he is more valuable to the club and should not play the second fiddle. Interestingly, Neymar reportedly unfollowed Cavani on instagram after the incident. See our top reactions below. Cavani can bully Neymar out of penalties all he wants, but if this tension continues, Neymar will be bullying him out of the club. Admit it…neymar wouldnt dare throw attitude messi's way…but cavani has to get with the program? If Cavani wants to continue playing at PSG he must accept Neymar is the King. Egos clashing between Neymar & Cavani at PSG proves how massive Messi is — not just as a football player, but as a person. Days like today recalls the greatness of Messi when he left him the penalties to Neymar, who does not allow a mediocre as Cavani. Neymar getting bullied off penalties. How is that even possible? You're the 200 mil signing and you can't get on pens?! BETA MALE. Cavani moved to the wing to accommodate Zlatan. Now that it's his time to shine, Neymar wants to stop his shine. Am sure Cavani is still pissed that Neymar was part of the team that demolished them 6:1 and here he is dragging setpiece with him. Neymar must have forgotten he was no longer at Barca.. He should be the playmaker now and not at the receiving end.